MicroSet 3 offers a rather remarkable function that allows you to analyze the nature of a watch tick in terms of its component sounds. -- it allows you to evaluate how well the timer is triggering on the watch, and to see if the watch is producing three clean sounds or a multitude of noises. The relationship between these sounds is also how a watch timer knows what the amplitude of the balance wheel is. Specifically, the interval of time between the unlocking and the drop is used with the beat time and lift angle to calculate a value for the amplitude. 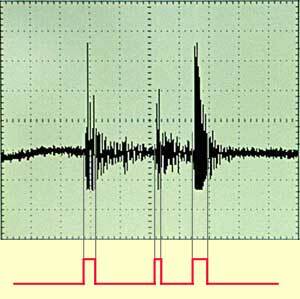 The image at the right is taken from an oscilloscope set up to display the complex sound of a watch tick. The three sound bursts can be clearly seen. MicroSet is not an oscilloscope, but it can also show you a representation of these component sounds, as illustrated by the red lines at the bottom. The window below shows the Tick Display function in version 3 of the Windows Interface Program for MicroSet. It works in conjunction with the Tick Display mode in the MicroSet 3 timer. The new mode analyzes the tick sound at intervals of 1/2 millisecond and determines the status of the tick -- "on" or "off". This information is transmitted to the Windows Interface Program and is displayed as a red line in the rectangular plot window you see below. On intervals when the tick was present the red line goes to the top of the window. When the tick is silent, the red line goes to the bottom. The point of transition between "on" and "off" is determined by the LEVEL control on MicroSet. In this window you see the desired three tick sounds. Along the bottom of the plot window are labeled the intervals of time from the beginning of the tick. In this case, the last sound ends at about 22 milliseconds. The human ear hears this as a single tick, of course. But MicroSet 3 is fast enough to differentiate the separate sounds. Along the top of the plot window are labels for the amplitude of the balance wheel, calculated as described above. The amplitude is indicated by the beginning of the last sound (the drop). In this tick, that happens at about 22 milliseconds and is shown to be about 200 degrees of amplitude. To get a precise value for the amplitude of this tick, you can move the mouse pointer over the plot window. The pointer becomes a crosshair, and you can position it on the leading edge of the last tick. The absolute value of the amplitude is then printed in the small window at the top right, as shown below. Buttons below the plot window allow control of the display. The ticks come in much faster than the computer can calculate and display them, so a button is provided to RESET the input data. Otherwise, the ticks build up a backlog in memory. Up to a point this is a good thing, because it allows you to view every single tick; the even ones are always different than the odd ones. A new tick is drawn on the screen approximately once per second. When the backlog of data becomes unneeded it can be discarded. A PAUSE button lets you stop and examine a single tick; RESUME continues afterwards. You can ZOOM IN or ZOOM OUT to adjust the display scale for the watch you are working with. Some watches tick as quickly as 10 or 12 milliseconds, others take as long as 75 or 80 milliseconds. CHANGE SETTINGS lets you define the beat time and lift angle for the watch you are examining.